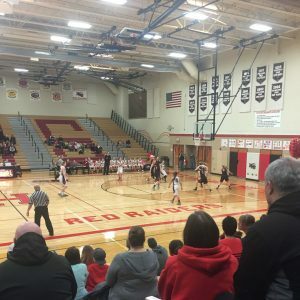 On a rainy Monday night, the stands were packed with Huntley fans and families, cheering on the girls at one of their last home games of their high school basketball career on Senior Night. Huntley’s starters-Lexi Lowitzki, Kayla Barreto, Paige Renkosik, Dani Nichols, and Teagan Papka, all of which are seniors- ran past their teammates during their traditional starting line up routine before taking the court. Huntley came out on top against Crystal Lake Central, winning the game 72-33 after dominating for the majority of the game. The Red Raiders, 21-3 on the season, never trailed in the game once after taking the lead early in the first quarter during the cross-conference matchup. Huntley started off the game strong with senior Teagan Papka winning the jump ball. After settling the ball and driving towards the net, Papka scored the first points of the night, putting Huntley up 2-0. After consecutive fouls on both Huntley and Central, the teams stayed tied at 2-2 for the majority of the first. The girls basketball team defeated the Crystal Lake Central Tigers 72-33 on Monday, Jan. 25. Huntley then controlled the game from then on, increasing their lead by more than 40 points after the third quarter. Andrews led scoring once again for Huntley, dropping 25 points total, which at one point during the third quarter was more than Central total. “It’s just really exciting after all four years getting to play with Raethz, and it means a lot getting to play with all of your friends and teammates because you really bond on and off the court,” said the senior and McHenry County’s all-time leading scorer. Among the top scorers of the game were Renkosik with 10 points, Morgan Clausen with 8 points, and Barreto with 5 points. The stakes were raised even higher for the six seniors on their senior night, but none the less, all 6 girls scored during the game. During the fourth, freshman Missy Moffett and sophomore Jackie Dorin were given their shot at playing time, both making an impact on the game on offense and defense. With Moffett scoring 2 points at the buzzer, that meant all three Moffett sisters had scored in the game. Junior Maddy Moffett and sophomore Mallory Moffett both scored early on in the first half. The night may have been emotional for some and even full of firsts; either way it was a night to remember, not just for the seniors but for all of Huntley’s girls. “It was bittersweet coming into this game tonight, but it was also kind of sad realizing it’s finally your senior night,” said senior Teagan Papka. 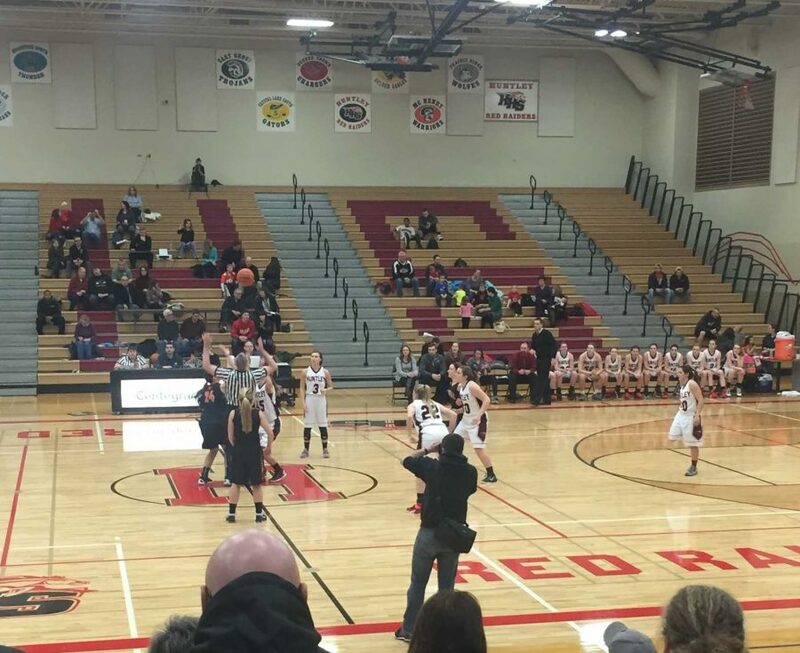 Huntley’s next game is away against Crystal Lake South on January 26 at 7 p.m.